Starred review! "Mallery pulls out all the stops in this highly enjoyable and insightful, funny, and poignant look at self-sacrifice and romantic entanglement." Update: Booklist named Evening Stars one of the Top 10 Romances of 2014! Top Pick! "Mallery's immensely entertaining, intensely emotional novel is a vividly descriptive, locale-perfect, stand-out story, starring an eclectic cast of unforgettable characters who will warm hearts and confound, and heroines that readers will champion. Although it concludes the trilogy, this BI book reads well alone." 5 out of 5 Ravens! "PERFECTO!... What I loved most about Evening Stars is that as the story progressed, each of the characters were forced to do some real soul searching in order to discover not only who they truly were, but also who they wanted to be in life." 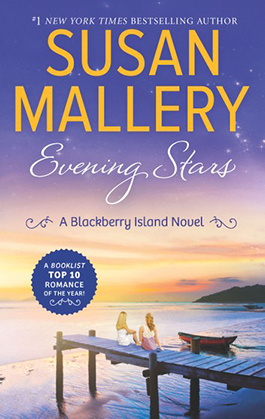 "Best-selling romance author Mallery delves into light women’s fiction with this third Blackberry Island novel, maintaining her romantic charm and smooth voice yet embracing the freedom of a broader storyline with ease and a bit more depth." 4.5 out of 5! "I laughed, I cried a bit; I screamed and wanted to 'shake' people... I thoroughly enjoyed this book and look forward to more from Susan Mallery." "...a finely crafted tale of regret and fear and the mixed curse and blessing that is family." "Will Nina prevail? Of course she will: this is romantic fiction. But the why and the how, and with whom, are all highly entertaining." "What did I expect from Evening Stars? A novel about familial relationships with a little romance on the side. What I didn’t expect was to get sucked into the lives of these four women. I simply couldn’t put the book down." "Author Susan Mallery is a gifted storyteller who delivers a tale that keeps the reader turning pages until the satisfying conclusion." "Evening Stars is a beautiful journey of self-discovery for the Wentworth women. Nina and Averil undergo a great deal of soul searching as they contemplate their pasts and in doing so, they are able fully embrace their futures. 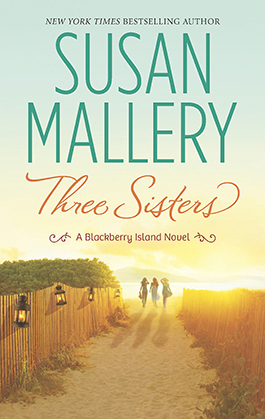 A lovely conclusion to Susan Mallery’s delightful Blackberry Island series." "While there are some romantic storylines in Evening Stars, the story is really about family and relationships and finding peace with yourself. Nina and Averil have a complicated relationship with each other and with their mother, and how they relate to each other has shaped the sort of people they became, for better or for worse. Evening Stars shows what happens when those relationships are challenged and reshaped, and just how empowering that can be." "I love this Blackberry Island series! ... Susan Mallery writes characters and dialogue that are so natural I don’t even stop to think that they might not be real." "Move over Danielle Steel. 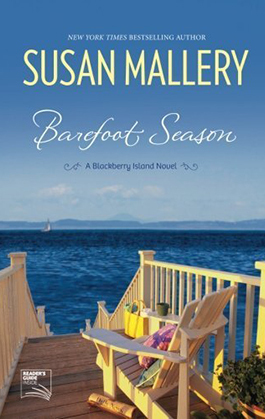 Susan Mallery is quickly emerging as the new queen of romantic fiction." "If you’re looking for a book to get lost in; a true love story about romantic love, family love, and friendship, then Evening Stars by Susan Mallery is the novel for you." EVENING STARS is a "Best Book of the Month!" 5 Stars! "This series is so heartwarming that it puts me in a great mood when I read it. The stories are so much more than just romance... Chronicling Nina’s journey to discover her inner strength, and her true dreams, this is a beautiful story. The characters are deep and complex, and very realistic." EVENING STARS has been named one of the Top 10 Romances of 2014 by Booklist, a publication of the American Library Association! "Evening Stars was definitely full of high drama but it was well-balanced by a cute puppy, relatable insecurities, that awesome antique store, and the adorable community of Blackberry Island." In a battle between Betty Boop and multicolored hearts, Nina Wentworth decided it was going to be a Betty Boop kind of day. She pulled the short-sleeved scrub shirt over her head and was already moving toward the bathroom before the fabric settled over her hips. The shirt settled as it should, with a couple of inches to spare. Nina breathed a sigh of relief. Last night's incident with three brownies and a rather large glass of red wine hadn't made a lasting impression on her hips. She was grateful, and she would repent later on an elliptical. Or at least vow to eat her brownies one at a time. Nina glanced from the clock to the phone. Everyone in her world—friends, family, work—had her cell. Very few calls came on the antiquated landline, and none of them were good news. Nina retraced her steps and braced herself for disaster. "Hey, Nina. It's Jerry down at Too Good To Be True. I just opened, and there's a lady here trying to sell a box of crap, ah, stuff. I think it's from the store." Nina carefully backed out of the driveway. Jerry's humor she could handle. He'd lived here all his life—he was allowed to tease her. But Sam was relatively new. He hadn't earned mocking rights. She hung up before he could offer advice on hiring policies and turned up the hill. The morning was clear—odd for early spring in the Pacific Northwest. Normally the good weather didn't kick in until closer to summer. To the west, blue water sparkled. To the east was western Washington. She hurried up the steps to the front porch that was both her boss's home and her office. Dr. Andi, as she was known, was a popular pediatrician on the island. Make that the only pediatrician. She'd moved here a year ago, opened her practice in September and had been thriving ever since. She was also a newlywed and, as of two months ago, pregnant. After storing her purse in her locker, she logged in to the scheduling program and saw that the first appointment of the day had canceled. Andi would appreciate the extra time to get herself moving. She was still battling morning sickness. Nina did a quick check of her email, forwarded several items to the bookkeeper/office manager, then walked to the break room for coffee. Less than five minutes after she'd arrived, she was climbing the stairs to her boss's private quarters. Andi had bought the house—one of three up on the hill—when she'd moved to Blackberry Island. Undeterred by the broken windows and outdated plumbing, she'd had the house restored from the framework out. During the process, she'd fallen in love with her contractor. Which had led to her current tummy problems. One of the advantages of working for a pediatrician was that cheerful attire was encouraged. She had a collection of brightly colored fun shirts in her closet. It wasn't high fashion, but it helped the kids smile and that was what mattered. Nina thought about the fact that she was going to have to go by the pawn shop and pick up what Tanya had tried to sell, then spend several hours at Blackberry Preserves, her family's antique store, figuring out what had been stolen, then tell her mother what had happened and possibly lecture her on the importance of actually following up on a potential employee's references. Only she'd been lecturing her mother for as long as she could remember, and the lessons never seemed to stick. No matter how many times Bonnie promised to do better, she never did. Which left Nina picking up the pieces. Since opening her practice, Andi had started a program of inviting local elementary school classes into her office as a field trip. Kids learned about a basic exam, were able to use the stethoscope and check their weight and height in a nonthreatening atmosphere. Andi's goal was to make a visit to the doctor less stressful. Normally the gift bags were filled by their receptionist before the event, but she had forgotten the stickers last time, so Nina had taken over the task. She was in the middle of lining up the open goodie bags for quick filling when her cell phone buzzed. She pulled it from her pocket and checked the name, then pushed speaker and set it on the break room table. "Montana. It was coming down like you wouldn't believe. We had about four inches, and the tires just couldn't handle it. We skidded off the road. We're fine now. Bertie found a Les Schwab store and the man there was just as nice as the one back home." She kept talking. Nina closed her eyes and rubbed her temples, telling herself that her commitment to eat her brownies one at a time had not made any reference to wine, and when she got home that night, she was taking a bath and having a glass. Then she'd have her breakdown. Bonnie Wentworth had given birth to her oldest at sixteen. She hadn't settled down when she'd become a mother, and she sure wasn't settled now. Bonnie and her partner, Bertie, traveled the country on "buying trips" for their antique store. Antique being defined very loosely in this case. Junk was probably more accurate, but even Nina avoided the "j" word as much as possible. "This is why I want to do the interviewing. Or, if not me, then at least let Bertie do it." "You're right. There must be someone, and I'm sure you'll find her." "That would be great," she said instead. "Thanks, Ellen." "That's exactly what I was thinking," she admitted. "But I'm glad she was impatient. Was Sam Payton by?" "You're welcome. Hire better people." He buzzed the door so she could get out. Nina crossed the small parking lot and opened her trunk. As she walked around to the driver's side, she felt the first drops of rain. Although the house was only a few blocks away, she was going to have to go by the store and put up a sign explaining it would be closed for the next few days. She should also see what else might have been stolen. This may not have been Tanya's first attempt. Tomorrow she would talk to Sam and find out what charges were being brought against the former employee. Two things happened at once. The rain went from light to pounding, and her car engine died. Completely. Not sure what to do, Nina steered to the side of the road and pulled onto the shoulder before she lost all momentum. After putting the car in gear, she started it again, or tried to. The engine turned over, but wouldn't catch. She checked the fuel, and her tank was just over half full. What on earth? Beyond how to put in gas and where to take it for service, what she knew about cars and their systems could fill a shot glass and still leave room for the shot. She was stuck. She glanced down at her shirt. "You've failed me, Betty." Nina got out her cell phone only to see she was in one of the dead spots on the island. Between the somewhat-isolated location and the hilly terrain, there were cell phone wastelands, with no signal to be had. So much for phoning a friend or Mike's Auto Repair. Because while Mike would come get her and give her a lift home, he wasn't psychic. She leaned her head back and tried to tell herself that a walk in cold rain wouldn't kill her. She only needed to get to a part of the island with a signal. Later, when she got home, she would have that bath and glass of wine. But being rational didn't take away her desire to scream or cry. Or just once want to hand this problem over to someone else. But there wasn't anyone else, there was her. She gripped the steering wheel with both hands and tried to shake it. "Drive, you stupid car! Drive!" She stopped when her hands started to hurt, then separated her car key from the house keys on the chain and tucked the car key under the driver's seat. Then she put her purse over her shoulder and stepped out into the rain. She was soaked in a matter of seconds. The good news was, if anyone she knew drove by, he or she would stop and give her a lift home. The bad news was, it was dinnertime on a very small island and the odds of rescue were slim. Nina started the long walk toward some kind of signal. With each step she told herself this was good. Forced exercise. Plus shivering burned calories. It wasn't cold enough that she had to worry about hypothermia. But her clothes clung to her in a way that wasn't flattering, and her pants were rubbing on her thighs. She was pretty sure she was going to get a rash. That would be attractive. Too bad she wasn't a blogger, because this would make for a great blog. She could title it "Nina Wentworth's Very Bad Day." Fifteen minutes later, Nina had started working through the five stages of grief. She'd quickly moved from denial to anger and thought that might be a good place to stay. Her entire body was chilled except for the friction where her thighs rubbed together. She was shaking, dripping and more miserable than she'd ever been in her life. She checked her cell, but there still wasn't a signal. At this rate, she would be home before she picked up reception. She heard a car coming up behind her and turned quickly. She didn't care who it was—she would happily get in with a stranger, if necessary. Not that there were many on the island this time of year. She squinted against the rain, trying to figure out if she recognized the vehicle. It was blue and shiny. A new BMW, she thought, as the car slowed. No one she knew drove one of those. The driver pulled up next to her and rolled down the passenger window. "Hey, are you—" The man stared at her for a second. "Nina?" Although she'd been reaching for the door handle, now she pulled back. The unfairness of the situation made her want to raise her hands to the sky and ask what she could possibly have done to deserve this. "Nina?" he asked again. "You're soaked. Get in. I'll take you home." But she couldn't, she thought, staring into those green eyes, remembering how they'd softened when he'd promised he would love her forever. Only he hadn't. Dylan Harrington instead had abandoned her and their forever love his third year of college. He'd left the island and never come back. Well, he'd visited his family occasionally. But he'd never bothered with her again. Not once. Worse, he'd said she was the reason he'd ended the relationship. Yet another person in her life who had been unwilling to take responsibility for his actions. "Nina, get in. It's freezing." "I'd rather walk," she said and turned away. Lifting her head proudly, ignoring the rain stinging her eyes and the burning of her chafed thighs, she proceeded to do just that.